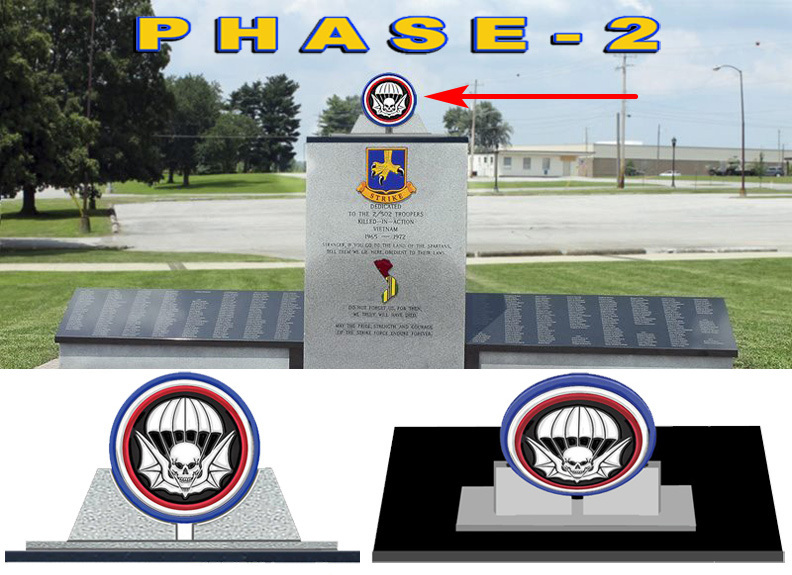 Because of your generous donations the 2/502 Memorial at Ft Campbell was redone and rededicated in August of this year. Now it is time to take it to the next level. Our Vietnam era Strike Force brought back the Widow Maker of World War II Glory - so it is only right and fitting that it should be placed on OUR monument. The design is shown in the image above - a Colored Glass Widow Maker that is 16" in diameter and 1/2" thick will be held by 2 gray granite holders mounted on a black granite base that will top the monument. This glass emblem will be made of glass just like the Strike emblem, but twice as thick. We will not proceed until we have received 90% of the money. Like we did for the Monument, there will be a completely separate account set up for this. Further information and updates will be posted here. No contribution is too small. All efforts will help get this done.